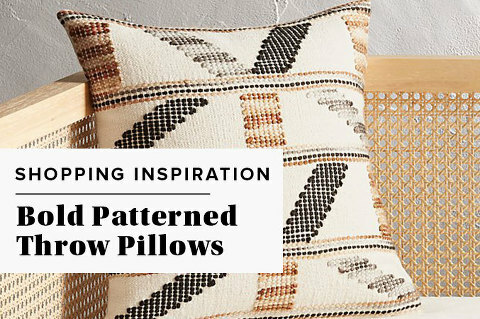 There are a few things I’ve learned about throw pillows over the years, number one being that they’re almost always more expensive than you think they’ll be! The other thing I’ve picked up on, though, is that you can make your investment go much farther by curating a collection that’s color-coordinated and cohesive. Of course, the same concept goes for practically any type of decorative accent you bring into your home, but if you focus on purchasing pillows that match each other and feel intentionally collected, then you can move them from room to room and never run out of combinations to try. One of my favorite ways to update or refresh a space is to mix up the pillows I have out in the room. For example, I’ll pull the pillows I have on our guest room bed and put them on the living room couch (and vice versa) to give both rooms a mini makeover without spending a penny. Keep scrolling for links to a dozen throw pillows I’d love to work into our current rotation. Here’s a bonus trick for you: buy pillow covers instead! That way you can store the covers flat when not in use, and just unzip the old ones from the pillow forms when you’re ready to change things up. This is a game changer for my storage since I’m not trying to stuff a bunch of thick, fluffy pillows into a closet. Instead, I’m able to fold the covers away flat and place them lightly into the drawers of our linen dresser. Got a pillow tip of your own to share? Do tell below.